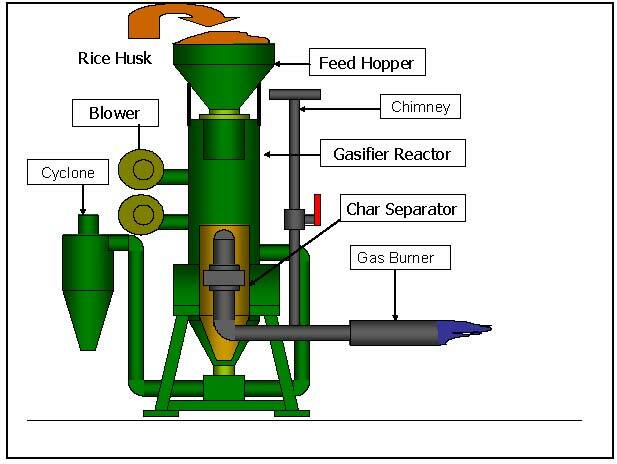 The gasifier, as schematically shown, has the following components: a 0.25-m diameter by 110-cm high single reactor where rice husk is gasified using limited amount of air for combustion; a ½-sack capacity feeding hopper situated directly above the reactor that feeds rice husks by gravity mode; a char chamber positioned directly beneath the reactor used to hold burnt rice husks and also served as an exit duct for combustible gases to the burner; a char separator attached to the char chamber for cleaning the gas leaving the reactor before the gas enters the burner; and an air injector positioned beneath the char chamber to gradually remove the char from the chamber pneumatically through a cyclone separator. A 2-inch electric blower supplies the air needed for gasification and a 2½-inch electric motor drives the pneumatic conveyor. 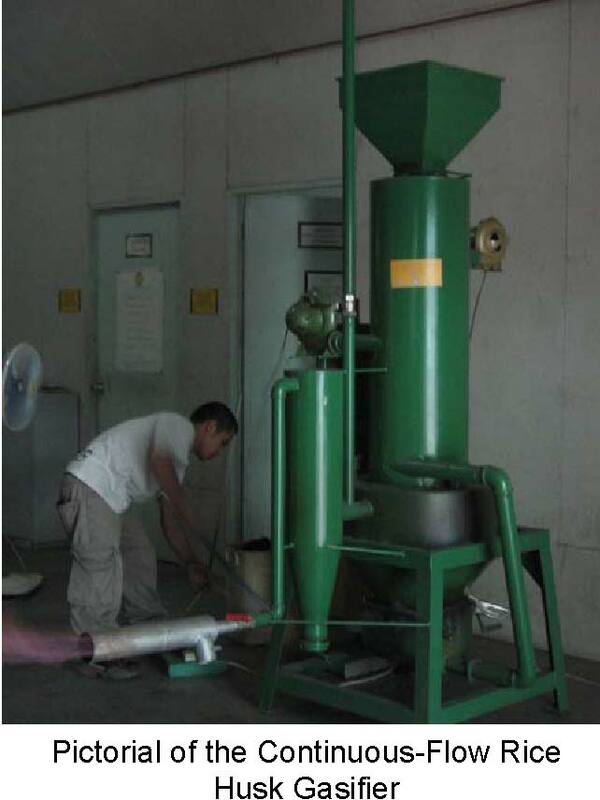 Gasification of rice husks in this gasifier is accomplished in a downdraft mode. Rice husks are fed at the top of the reactor and are burned at its bottom. Air is introduced into the bed of rice husks from the top of the reactor and moves downward through the fire zone. Fire zone is maintained by gradually removing the char from the char chamber employing a jet-type pneumatic conveyor installed right beneath the reactor. The gas generated in the reactor during gasification is directed to the burner passing through the momentum separator. Char is separated from the gas by a 30-cm diameter cylindrical shape momentum separator. 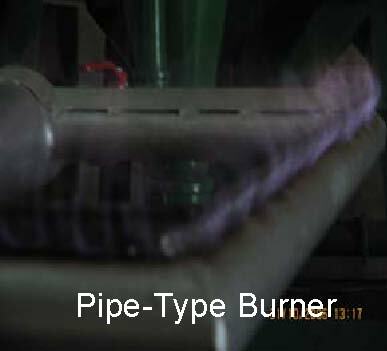 The gas produced is burned either in a jet-type, a gas pipe-type, or a drum-type burner. The air that is used to convey the char is also used to cool the reactor at the same time. At the end of the conveyor is a cyclone separator to separate the char from air. A water container is provided at the bottom of the cyclone to immediately cool the hot char that is leaving the reactor. Performance testing and evaluation showed that the gasifier can be successfully operated in a continuous mode. Firing of the reactor can be start-up evenly by using only few pieces of paper and by sprinkling kerosene at the bottom of the fuel bed. Once spontaneous combustion of fuel is attained, combustible gases are generated. Tests have shown that the gasifier consumes rice husk fuel at an average rate of 8.3 kg per hour. The amount of air used to gasify rice husk was measured at 13.2 m3/hr giving an equivalence ratio for the gasifier reactor of 0.4 The temperature of the gas leaving the reactor using a type k thermocouple wire thermometer was measured at 117 to 205°C whereas the air used to cool the reactor and, at the same time, used to convey the char was measured at 50 to 87°C. The computed specific gasification rate of the reactor is 169.2 kg/hr-m2. Based on the airflow and the cross-sectional area of the reactor, the computed superficial velocity of gas in the fuel bed is at 7.5 cm/min. 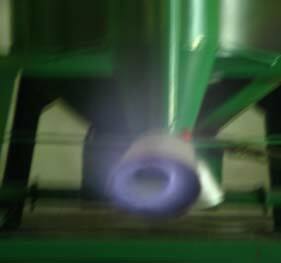 The pneumatic conveyor operates well at a char-to-air ratio of 16.5 and for a terminal velocity of air inside the duct pipe of 11.5 m/s. Based on the energy generated from the gas and the energy available from the fuel, the overall efficiency of the gasifier is 63%. And, the computed power output is 19 kW. 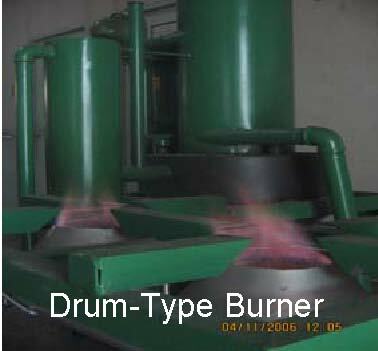 The gasifier can be used to supply combustible gases and effectively burns fuel either in a jet-type, pipe-type, or drum-type gasifier burner. 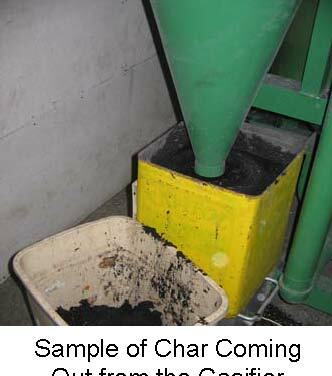 The char that is produced from the gasifier is completely black (40% of rice husk), which is good for soil conditioning. The cost of the gasifier is P35,000.00 per unit (1 US$ = 55 PHP). It requires a single person to attend its entire operation. Operating the gasifier entails a total electric power consumption of 0.4 kW. The computed payback period is less than 1 year when compared with LPG burner. The continuous-flow rice husk gasifier is of more advantage than the dual reactor rice husk gasifier primarily in terms of current investment cost. Instead of using two reactors, only one reactor is used which means lesser material cost. 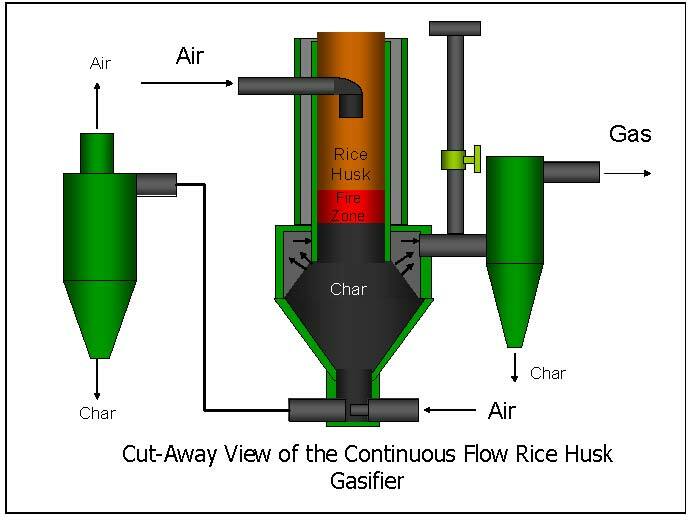 Other features of the continuous-flow rice husk gasifier are: (1) It is convenient to operate in which reloading of rice husk and unloading of char are eliminated; (2) It saves space since it has only one reactor; and (3) The size of the reactor can be scaled up or down, depending on the requirement of the client. Good day and God bless!! !